Hello, readers! Spring is almost upon us (and already feels like it’s arrived here in Georgia) and I’m back, for the most part, from what’s been a lengthier hiatus than I hoped. The transition from living in Charlotte to living in Macon has consumed most of my time recently, and in combination with a number of other factors, which I’ll pepper throughout my upcoming posts, has prevented me from writing as frequently as I’d like. The most significant factor in my blogging hiatus has been our living situation – rural, remote, removed – are all words you could use to describe it. Incredible also comes to mind. I already know that I will look back on these few months of renting in small-town Georgia as some of the best days of our early years of marriage. We have no internet, cell service that can be described as spotty at best, we’ve found two (wait, three) small lizards in our master bedroom, and you have to drive more than a mile down a dirt road to get to our house – but being so disconnected from the outside world has made our little family unit (Nick, Lexi, and me) re-connect and connect in entirely new ways. For her doggy part, Lexi is in her personal heaven. She has more than seven acres to patrol (and play fetch on), and I believe these probably will be the best days of her life. In terms of blogging, the lack of internet access at home has been the biggest hurdle. But here I am, with a weekly recipe to share with you at last. I will try to do better with regular posting as the weeks go on! For the first several weeks that we lived here, we didn’t have any propane – consequently, the gas stove didn’t work – and I was limited to cooking oven-only meals. I had no idea how challenging that would be! It turns out I use the stove top a lot more than I realized, even for meals I would have previously considered oven-only. So I scoured my recipe books (predominantly from Maine) for main and side dishes that I could create without using the stove. 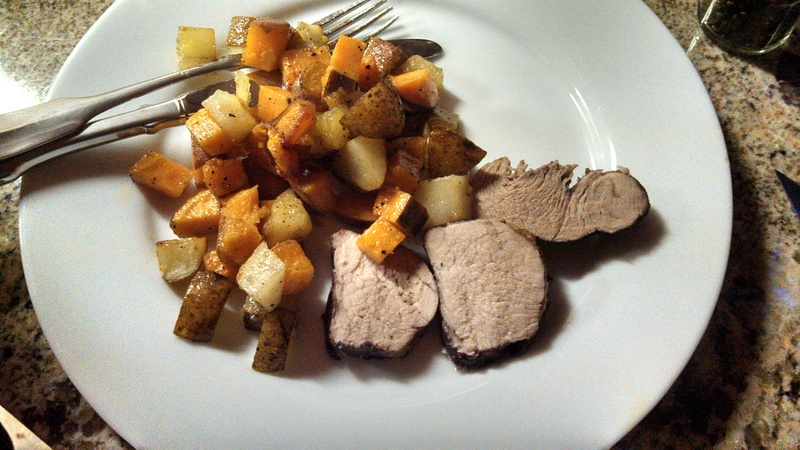 Renee’s Company Pork Tenderloin, from Recipes from the Maine Kitchen, was truly exceptional. It was easy, low-maintenance, and delicious. You can find this recipe on page 133. I recommend it with roasted vegetables, and it serves 4-6. Preheat oven to 400 degrees. Rub tenderloin with olive oil, sprinkle with salt and pepper. Place in roasting pan. 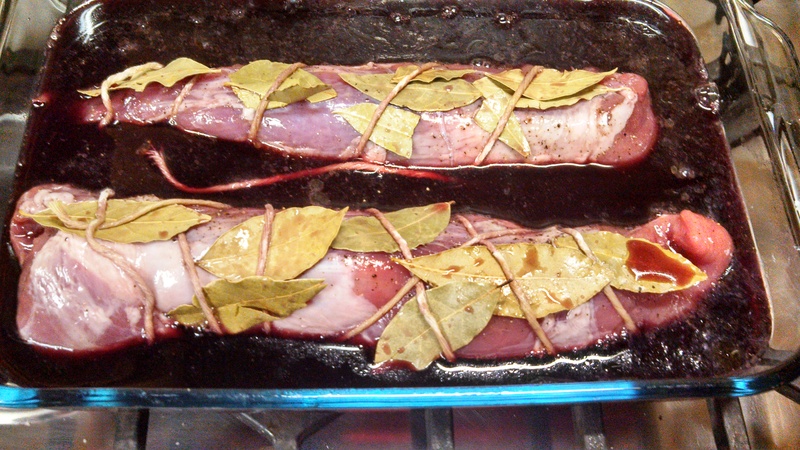 Place bay leaves over pork and secure with kitchen twine by crisscrossing from end to end. Pour in bottle of red wine. Cook for 50 – 60 minutes or until pork is done to your liking. At this point, it had been smelling delicious for a while! 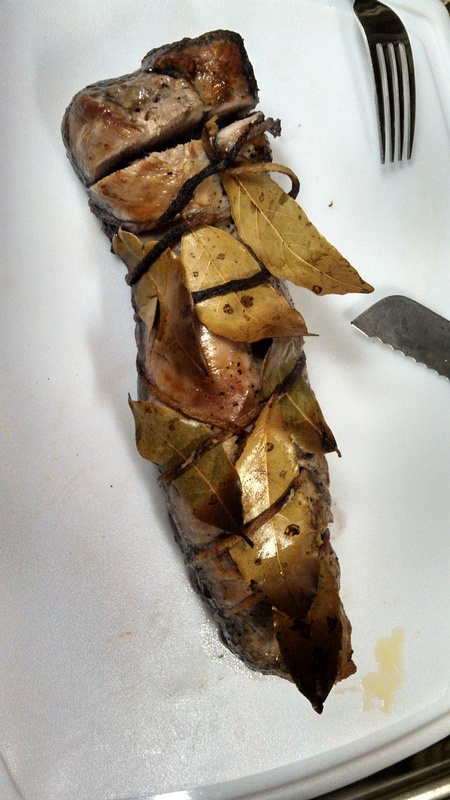 Remove string and bay leaves, slice pork into thin slices and arrange on plates. Serve with roasted potatoes.